On a scale of one to ten, how do you rate PM Abiy Ahmed? Ethiopia’s Prime Minister, Abiy Ahmed, will clock one year in office on the 2nd of April, 2019.At just 42-years-old, the ever-smiling prime minister sits on the helm of affairs of one of Africa’s greatest countries and chairs both the ruling Ethiopian People’s Revolutionary Democratic Front (EPRDF) and the Oromo Democratic Party (ODP). Prior to his inauguration, critics had doubted his capability to steer a country like Ethiopia and stabilize the EPRDF, which consists of four political parties, namely Tigray People’s Liberation Front, Amhara Democratic Party, Oromo Democratic Party, and Southern Ethiopian People’s Democratic Movement.There is no doubt that he has surprised the world.The “RD” in EPRDF which stands for Revolutionary and Democracy is no doubt the blueprint of Prime Minister Abiy Ahmed in the last twelve months of ruling Ethiopia. During his time, he has done a lot in reforming the country and re-defining governance. This has also been reflected in the entire region as he has been dubbed ‘the unifier’ and ‘transformer’.Even his opponents will admit that he has done well since coming into office. Below are a few of Abiy’s achievements in less than one year since becoming prime minister of Ethiopia. True to his word, Prime Minister Abiy Ahmed signed a peace deal between Ethiopia and Eritrea in July, putting to an end two decades of bitter relations. He promised to withdraw Ethiopian forces from the borders and end the killings. In December, barely five months after the peace deal was signed, Ethiopia concluded all arrangements and withdrew its troops from the Ethiopian-Eritrean boarders. In line with the African Union’s decision to improve Regional Integration in the continent and while other Africa leaders were still dragging their feet one step forward and two steps back, Ethiopia adopted the Visa on Arrival policy for Africans across the continent. He re-positioned Ethiopian Airlines, making the current best airline and one of the biggest Pan-African brands in Africa. He reconciled his country with Somalia after 41 years and flights to the neighboring country resumed after four decades. In what was the first in Africa, he reduced his cabinet members to just 20 and surprised the world when he released the list to reveal that ten out of the twenty ministers were women. Ethiopia currently has the only female president in Africa after the Prime Minister appointed Mrs. Sahle Work-Zewde for the position of president in October. It was swiftly passed by the parliament. During a speech in October, the Prime Minister again shocked the world when he revealed that he was on a monthly salary of $300. African leaders hid their heads in shame when they saw this because some of them earn as much as $591,871.68 annually as their official salary. He promised to reach out to opposition both home and abroad, and this he did. In November, he lifted the ban on Berhanu Nega – who had been exiled for many years because of his critical views of the former regime. Nega finally returned to Ethiopia, a signal of Abiy Ahmed’s sweeping democratic reforms. He made himself an emissary in the Horn of Africa and has successfully united the region. The United Nations arms embargo and sanctions on Eritrea was lifted after Abiy Ahmed organized reconciliation between the country and its neighbors with which it was in conflict. Ethiopia was rated as one of the fastest growing economies in 2018. Oh Finfinnee! May Reason & Justice Prevail! The humanitarian situation in 2019 will remain similar to 2018 mainly due to mass internal displacements in various parts of the country, and related humanitarian and protection needs. The Government of Ethiopia and humanitarian partners will formally launch the 2019 Ethiopia Humanitarian Response Plan (HRP) on 7 March. Some 90,000 displaced people in Amhara region need urgent assistance. Improved security along the OromiaSomali border is enabling humanitarian partners to move relief commodities to Dawa zone after more than a year. Access constraints has impacted humanitarian partners from providing meaningful assistance to IDPs in certain sites of Gedeb woreda (Gedeo zone), where most IDPs are concentrated. The joint Government and partners Ethiopia Humanitarian Response Plan (HRP) for 2019 will be formally launched in the presence of Ato Mitiku Kassa, Commissioner of the National Disaster Risk Management Commission; Mr. Aeneas Chuma, UN Resident and Humanitarian Coordinator; as well as humanitarian partners, donors and the media at the Strategic Multi-Agency Coordination forum (S-MAC) on 7 March 2019. The Plan lays out prioritized humanitarian needs in 2019 across eight sectors, including food, nutrition, shelter and non-food items, water, sanitation and hygiene (WaSH), health, education, protection and agriculture. In addition, communities who suffered consecutive years of severe drought, who lost productive assets, or took on significant debts to shoulder the brunt of the crisis, will continue to need sustained humanitarian assistance and recovery during the year. Accordingly, at least 8.3 million people will require relief food/cash and non-food assistance during the year. Women in Africa are often at the forefront of campaigns for sustainability, justice and sovereignty. Credit: CIAT/Neil Palmer. We need an “African ecofeminist future”. And by we, I don’t just mean Africa, I mean everyone. I say this for two reasons. Firstly, Africa is now the “final frontier” for economic models that have already ecologically compromised the rest of the planet. Not long ago touted as the world’s “basket case” but now covetously viewed as its future breadbasket, a sustainable alternative in Africa is possibly the final bastion against global environmental degradation. Secondly, women and feminist activists are already on the front line of the battle for ecological sustainability on the continent. Their everyday struggles, uncompromised commitment, and willingness to envision a radical future in which justice, equity and rights harmonise with environmental sovereignty have the potential to save us all. So what is ecofeminism, and why African ecofeminism specifically? Ecofeminist activism grew out of feminist, peace, and ecology movements of the 1970s and 1980s. Intersectional ecofeminism also underscores the importance of gender, race, and class, interlinking feminist concerns with human oppressions within patriarchy and the exploitations of a natural environment that women are often more reliant upon but also its guardians in many cultural contexts. But whilst the broader movement has sometimes been bogged down in a divisive debate over whether gendered associations with nature essentialise women, movements engaged in feminist and ecological activism in Africa have simply gotten busy building strategic and political alliances between women, nature, and protection of the environment. Wangari Maathai and her Green Belt Movement arguably epitomise the essence of African ecofeminism and the collective activism that defines it. As the first environmentalist to win the Nobel Peace Prize, in 2004, Maathai highlighted the close relationship between African feminism and African ecological activism, which challenge both the patriarchal and neo-colonial structures undermining the continent. Lesser -known activists, however, have also long been at the intersection of gender, economic, and ecological justice. Ruth Nyambura of the African Eco Feminist Collective, for example, uses radical and African feminist traditions to critique power, challenge multinational capitalism, and re-imagine a more equitable world. Organisations like African Women Unite Against Destructive Resource Extraction (WoMin) campaign against the devastation of extractive industries. Meanwhile, localised organising is also resisting ecologically-damaging corporatisation: in South Africa, Women Mapella residents fought off land grabs by mining companies; in Ghana, the Concerned Farmers Association, led largely by women, held mining companies accountable for pollution of local watersheds; and in Uganda, women of the Kizibi community seed bank are preserving local biodiversity in the face of the commercialisation of seeds by corporate multinationals. These activists on these front lines are fighting back, but they are also offering visions of alternative development models that demand both gender and economic justice. In doing so, they ask us all to reconsider what constitutes “progress” in the first place. African women are often at the heart of communities dealing with huge changes related to economic development and shoulder the burden of environmental mismanagement. These concerns are multi-layered, and range from agrarian justice through to extractivism, but one issue that particularly clearly demonstrates the importance of African ecofeminism today is the threat to seed biodiversity. This is an increasingly worrying concern. In the 20th century, an alarming 75% of crop biodiversity was lost, according to the UN’s Food and Agriculture Organisation, and this trend has continued since. In the last decade, for example, Europe and Central Asia have seen 42% of their terrestrial animal and plant species decline in population size, partially due to intensive agriculture and forestry practices, with more natural resources being consumed than produced. Currently, the Green Revolutions seen in Europe, the US and, more recently, parts of Asia – which have involved moving from subsistence agriculture to industrialised farming, cash cropping and mono cropping – remain at the forefront of thinking around economic growth and food security. However, there is increasing evidence that this corporate-driven vision, which has dominated development trajectories over the last century, has failed on several fronts. Not only has it failed to address hunger despite overproduction, it has indirectly reinforced biodiversity losses and therefore nature’s more holistic contributions to a sustainable environment. Before the Green Revolution in India, for example, there were roughly 50,000 varieties of rice. Within 20 years, this dropped to just 40. This has resulted in the loss of crops once part of diverse food baskets as well as a degradation of farmers’ ownership and control over seeds. Seed sovereignty is therefore a key pillar of ecofeminism, and the relationship between seed biodiversity and women is particularly critical. Women, who are often central to domestic food production, are also frequently the custodians of seeds that reproduce balanced, varied and nutritional diets. In Africa, female farmers often preserve diverse (and indigenous) crops that remain off the cash-cropping agenda, from myriad varieties of spinach and cassava to the less well-known acha, a paleo grain native to parts of the Sahel. Among other things, women’s indigenous knowledge around seeds and their selection, storage, and planting of diverse and often hardy crops increase climate resilience, placing them right on the frontline of the battle against climate change. By contrast, extensive mono-cropping has actually made agriculture more vulnerable to pests, disease and drought, often leading to a dependence on the pesticides and fertilisers produced by the same companies that sell the commercial seeds now being pushed across Africa. Indeed, commercial seed capture on the continent is on the rise, with corporate-invested pushes towards regulations that authorise the planting of only selected seeds. Hybrid seeds aimed at maximising yields in particular are being prioritised. This is deeply problematic as hybrid seeds cannot be replanted, meaning farmers must buy new ones each season. Through this, farmers lose their autonomy, while the women who’ve been custodians of seed knowledge for centuries are disempowered. The commercialisation of seeds is therefore not just reducing variety and undermining climate resilience, but also compromising food sovereigntyas a small cabal of multi-nationals monopolise the market. An info-graphic making the social media rounds a few years ago highlighted that if everyone on the planet consumed like in the United States, we would need 4.4 Planet Earths. The reality that accepted models of development are unsustainable is no longer news to most. Meanwhile, there is a growing public awareness around threats to biodiversity and climate resilience as well as of the tensions that have arisen as a result of corporate-driven agricultural agendas. And yet, most African governments remain anchored to the idea of a Western-inspired green revolution, and are beholden to donor support (from the West as well as China) that is often invested in agribusiness expansion. Policy spaces still rarely welcome the voices of smallholder farmers and those working at the grassroots, leaving alternative positions and challenges to orthodox models of economic development on the margins of regional and global tables where decisions are brokered. Undeterred, however, ecofeminists continue to fight at the coalface of this struggle. From Ghana to South Africaand beyond, women-organised seed-sharing initiatives continue to resist corporatisation. Activists like Mariama Sonko in Senegal continue to lead on agroecological farming initiatives for localised and sustainable food production. Ultimately, the crisis of Africa’s current trajectory is a crisis of visioning: the inability of the continent’s leaders to imagine a process of development less destructive, more equitable, less unjust, more uniquely African, and – quite simply – more exciting. The positions, passions, and holistic approaches offered by African ecofeminism provide key ingredients for an alternative to the capital-centric ideals of economic growth that have defined progress so far. These have not only wreaked havoc on global ecological sustainability but have failed to deliver a genuinely equitable or just society anywhere. It’s time to start dreaming and delivering an African future that can do better than that. Hiriirri nagaa Oromiyaa keessatti magaalootaa fi bakka heddutti guyyaa sadaffaaf geggefamaa oolera. Kayyoo isaa yeroo gabaabaa waan guuttateef hiriirri kun yeroof har’a boodee akka dhaabatu ibsamee jira. ምስጋና ለቄሮ፣ ለጸጥታ አካላት እና ለሰፊው ህዝብ !! Hiriirri nagaa Oromiyaa keessatti magaalootaa fi bakka heddutti geggefamaa oolera. Amma gaaffiiwwan ka’an deebii quubsa argatanitti akka itti fufuf qeerroon beeksisaniru. Hiriirri kun kaleessa Koyyee Facceetti akka calqabe beekamee jira. Thousands of demonstrators in several cities and towns across the Oromia regional state have taken to the streets today. 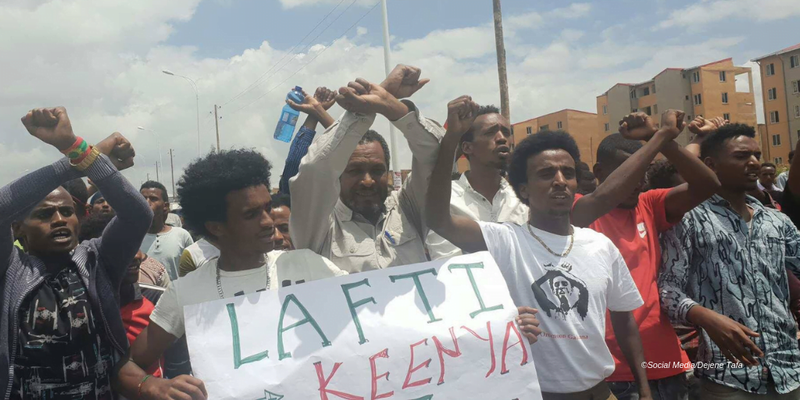 The protests were triggered after the Addis Ababa City Administration Savings & Houses Development Enterprise (AASHDE) handed over thousands of condominium houses located both in the city, and in Oromia regional state special zone. Addis Standard confirmed from local security and police officers that protests took place in the following cities: Adama, Shashemene, in western Arsi, oromia regional state; Bale Robe and Assela in south east Oromia; as well as Haramara in eastern Oromia regional state. A report by the BBCAmharic said protests have taken place in in ten cities across the region. Demonstrators are protesting AASHDE’s decision to hand over thousands of condominium houses using a computerized lottery draw without the involvement the Oromia regional state, which has administrative jurisdiction of the site where Koye Feche one and two condominiums are located at. Some 7,127 people were given condominium unites of studio, one and two bedroom apartments built on a vast plot of land which used to a farmland. The winners of yesterday’s lottery draw were those who were registered for the housing under the saving schemes commonly known as 20/80 and 40/60 in which they were asked to save 20% for studio, one and two bedroom apartments and the government promised to help with the remaining 80%. The same mechanisms were applied for those who could save 40%. Would be home owners were also told that if they saved 100%, they would be automatically entitled for the apartments. But the scheme has already left many dissatisfied as the mayor’s office recently scraped that and said the administration would stick to the original saving mechanism of 20/80 and 40/60. The winners who got the apartments located in Koye Feche one and two sites, located in the southern outskirt of the city of Addis Abeba, some 20 km into the Oromia regional state administrative border in Akaki/Kality area, are those who are under the 20/80 saving scheme. While the apartments with three bedrooms are located in various condominium sites mostly in Addis Abeba. Koye Feche is located in one of the eight zonal towns surrounding Addis Abeba which were established by the Oromia Regional State under the administrative name of “Oromia regional State Special Zone Surrounding Finfinne” in 2008. Now, protesters are saying the Addis Abeba city administration is acting outside of its jurisdiction and without involving Oromia regional government. Many are carrying banners reading “our land is our bones,” “Koye Feche is in Oromia”, and “No to the master plan,” the later in reference to the infamous city master plan which wanted to expand the city of Addis Abeba into the surrounding Oromia region towns and cities. Although it was later scarped, the master plan was one of the immediate causes that triggered the sustained three years protest in Oromia regional state. 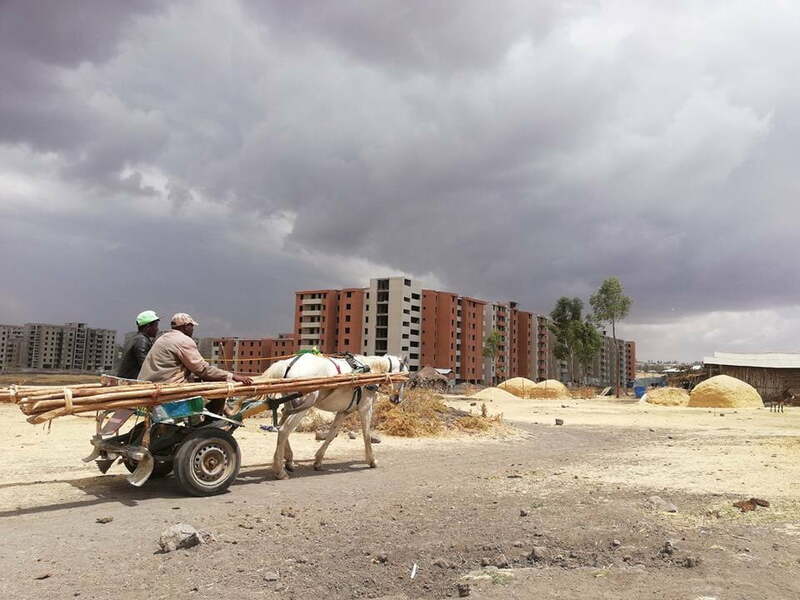 Koye Feche site one and two is only one of the multiple condominium sites built by Addis Abeba city administration on sites located in various places within the Oromia special zone over the last ten years. However, the administrative procedure in which the lands were taken from the farmers and the inadequate compensations paid afterwards, the shocking details of which were revealed by a former federal official, drew severe criticisms in recent years as hundreds of thousands of farmers were left itching to have ends met. During the lottery ceremony yesterday, Takele Uma, deputy mayor of Addis Abeba, said that families of displaced farmers were included in the housing distribution without the lottery draw. “We would like to say that your pain is ours, especially those of you who have lost your farmlands in order to clear for these [housing] projects and were exposed for economic and social crisis,” Takele said. However, Takele did not explain what has been done both by city authorities and the regional state to include those who have been dispossessed for little compensations. Several people at Koye Feche one and two sites and at Bole Arabssa site, a site for another massive condominium project, who spoke to OBN said they have been contacted neither by city administration officials nor by officials from the Oromia regional state special zone. Addis Standard’s attempts to reach both officials since yesterday has been to no avail. Posted by OromianEconomist in #SidamaProtests. Lafa Oromoo saamanii qaama Finfinnee godhuuf murteen har’a dabre ergaa guddaa dabarseera. Hurrii duraan nutti maraa bahan nuu saaqee qulqulleesseera. Akkuma kaleessa jenne gara itti deemaa jirru nuu akeekeera. Murteen kun hayyama MNO ala godhame jechuuf ragaan hin jiru. Taakkalaan ODP dha. Finfinnee isatu bulcha. Ixaa kanas isatu baasise. Kanaafuu ODPiitu lafa Oromoo lubbuun gootota qaqqaalii 5000 itti gabbarame dabarsee kenne. Dantaa Oromoo dabarsanii kennuun waadaa kaleessa ”Gooftaa keenya ummata keenya” jedhan san ganbuu dha. Gantuuf ammoo gatii barbaachisu ummanni keenya ni beeka. Salphoo soqolatte soqolaa gargaaruu itti beeyna. Qabsoo kee dhiiga kumootaa itti wareegdee asiin geesse. OPDOn sabatti deebiteetti jechuun amanattee imaanaa kee itti kennattee nu ceesisi jetteen. Amma jarri imaanaa kee ormatti gurgurataa jirti. Kanaafuu bakka jirtuu ganiinsa kanaaf deebii malu kennuuf of qopheessi. Rakkoo sababa kanaan dhalachuu malu kamiifuu kan itti gaafatamu qaama imaanaa ummataa gane qofa dha. Guyyaa har’aa irraa qabee tasgabbii dhabiisa dhalatu kamiifuu kan itti gaafatamu qaama Mootummaa ofiin jedhuu dha. Qabbanaahu harka, gubu fal’aana! Dhimmi finfinnee ijjannoo ifa ta’een qabsa’uu qabna. 1ffaa bulchiinsi finfinnee guutummaa guututti Oromiyaa jala galuu qabdi. Akkuma magaalaan oromiyaa keessa jiraatan daangaa magaalaaf malu Mootummaan oromiyaa tolchuu qaba. 2ffaa Eenyummaan oromoo waggaa 100 oli finfinnee keessaa haqame bakkatti deebi’uu qaba. 3ffaa seerri wayyaaneen fayidaa addaa jettee dhimma finfinnee tumte guutummaatti haqamuu qaba. 4ffaa hixxaan amma bahe kun guutummaatti haqamuu qaba. Kondominiyeemii. Koyyee Faccee, Galaan, Tullu Diimtuu fi Galaan bulchiinsa Godina Addaa Oromiyaa gala jiru. Finfinneen seeraan ala ijaarte. Tarkaanfiin sirrii manneen kana godina addaaf dabarsanii akka godinni raabsu gochuu qofa. Raabsaan amma Finfinneen goote seeraan ala. Namni Finfinneen kenniteef tokkos itti galuu hin danda’u. Hundeeffamni OMN waggaa 5ffaani magaalaa Finfinneetti Bitoottesa 3 bara 2019 haala o’aan kabajamee oole.